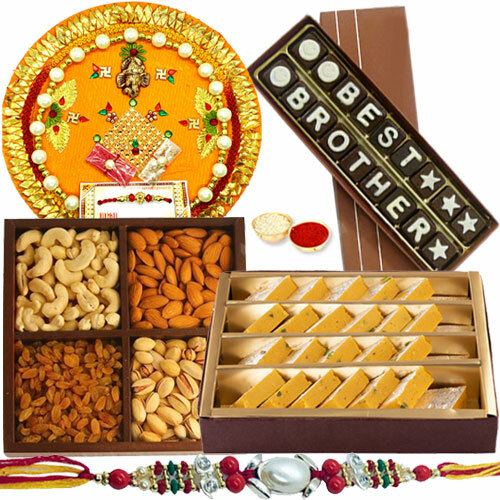 Deliver affectionate wishes and prayers for the people you love by ordering for them this Amazing Hamper of Holy Shree Thali,Homemade Best Brother Chocolate, Mixed Dry Fruits and Badam Barfi from Haldirams supplemented with a Rakhi, Roli Tilak and Chawal free of cost. The gross weight of Badam Barfi and Mixed Dry Fruits are 250 Gms. The pattern of the Rakhi may comes with variation. Homemade Chocolate, Mixed Dry Fruits 250gm, Haldiram Badam Barfi 250gm, Shree Thali, Stone Rakhi and a free Rakhiand Roli Tika and Chawal. Hamper containing Homemade Chocolate, Mixed Dry Fruits 500gm, Haldiram Badam Barfi 500gm, Shree Thali, Stone Rakhi and a free Rakhi and Roli Tika and Chawal. Dazzling Homemade Chocolate, Mixed Dry Fruits 1kg, Haldiram Badam Barfi 1kg, Shree Thali, Stone Rakhi and a free Rakhi and Roli Tika and Chawal.